A feeble murmur outside my hotel room’s window woke me up before my alarm time. Stumbling out of my bed in a frisson of excitement, I gathered my stuff and ran towards the viewing point. There were already a few camera-wielding larks occupying the vantage points. As we waited with bated breath gazing towards the dissipating clouds in the horizon, the glittering peak of Kanchenjunga in the morning twilight came into view. Despite being strangers at that moment, all of us felt a unified joy of sharing nature’s elemental beauty. I still rhapsodize about that experience, a moment which was suffused with inexplicable emotional resonance. 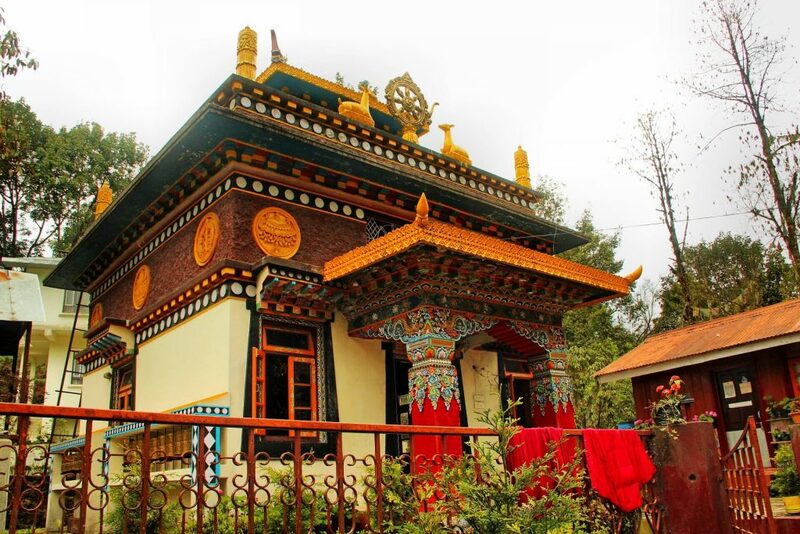 I had travelled to the small obscure town of Pelling in West Sikkim. 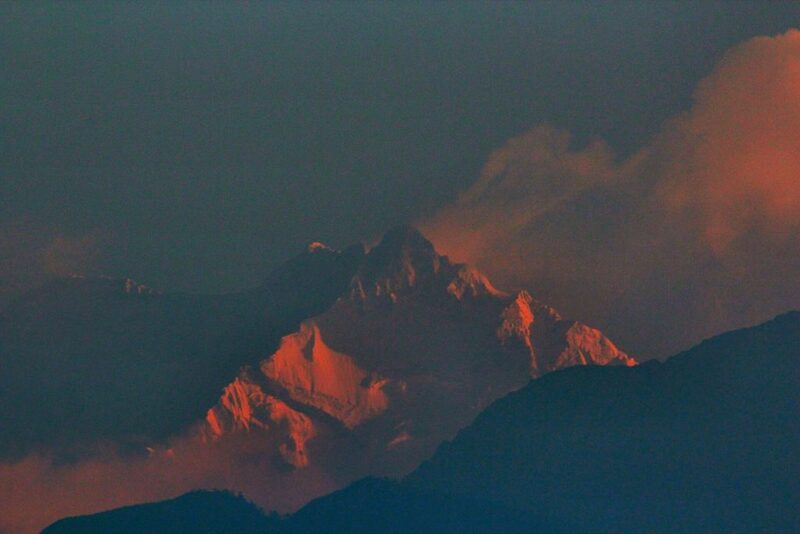 Kanchenjunga is the 3rd highest (28169 ft.) mountain in the World. I finally got a glimpse of the elusive summit on the final day of my stay after three failed attempts on previous mornings at ungodly hours. 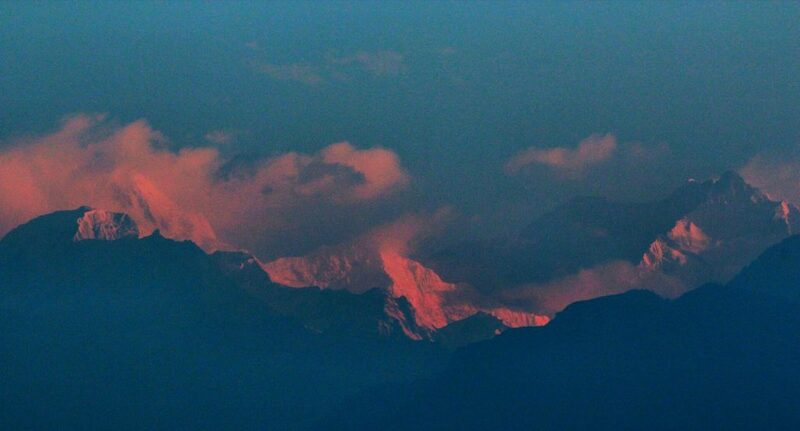 The first rays of the sun illuminated the snow-clad peaks of Kanchenjunga, Kumbakaran, Kabru and Pandim in a faint crimson hue. The whimsical clouds kept on veiling the cliffs as per their musings. Any clear visual was matched by reverberating sounds of shutters desperately trying to get the best shot. Pelling is considered to be the last civilized point to see Mt. Kanchenjunga. However, this rustic settlement has a lot more to offer than the solitary view of the mountain peak. “We are the most preferred bridegrooms in these parts”, announced my loquacious driver, Morong, while on our way to Khecheopalri Lake. I couldn’t immediately understand the meaning as I was more concerned about the speeding vehicle on the narrow pothole infested roads. Similar interesting information about this remote area helped me endure the arduous journey of 3 hours for a 30 km distance. Unknown to thousands of visitors who come here, the emerald green lake surrounded by 500 acres of broad-leaved forests is a ‘wish fulfilling’ lake. Reminiscent of childhood stories of wishing wells, I wondered if I should throw a coin. The water here is mysteriously calm, seemingly content with the tag of a sacred lake. I invariable walked around for a bit to absorb the place’s sights and sounds. The glorious loneliness, the fluttering prayer flags, the ubiquitous chirping of insects and the occasional temple bell made me ‘wish’ for the time to stand still. Considered sacred by both Buddhist and Hindus, the water is only used for ritualistic purposes and there is no scope for boating or picnic. The fall is located on the way from Pelling to Yuksom (the first capital of Sikkim). I could hear the resounding noise of the fall from the road. A short vertiginous climb through a path of narrow stone slabs took me to the base of the falls. Only the roar of the waterfall was audible above the sounds of my frantic heartbeat which I realized wasn’t at the gushing sight of the shining frothy fall, but due to my contentious fitness level. 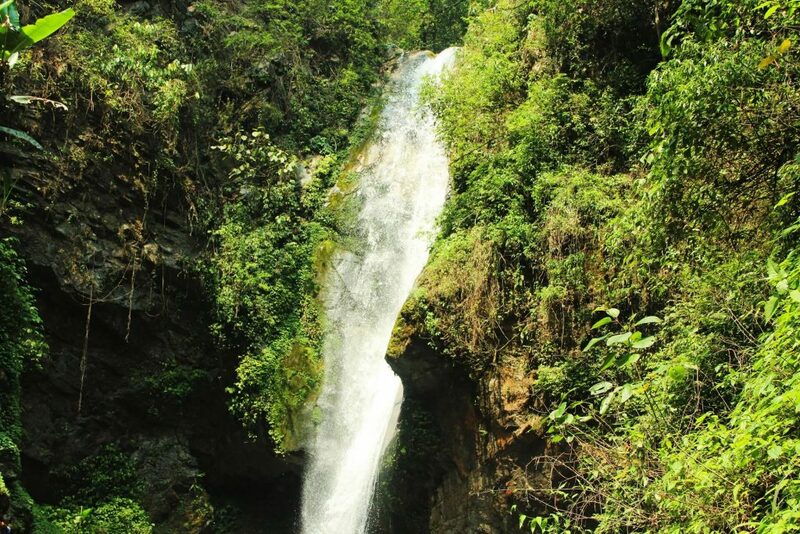 Falling from a height of 300 ft., Kanchenjunga Waterfall is placed between a spectacular carve of two hills. Strewn with boulders, moss-covered rock faces and lush vegetation, the place has a wild look to it. A special snack of “black chana” is sold by the few vendors along the stairs. Mixed with onion, chilly, cucumber, tomato and spices, it is a must try. I had read and heard a lot about the 300-year-old Pemyangtse monastery. It is set atop a verdant green hill at 6000 feet and surrounded by moist temperate Oak forests. I couldn’t have chosen a worse day to visit Pemyangtse. The sky was overcast with gusts of cold wind flowing intermittently. However, wet roads and a constant drizzle did little to dampen my spirits. As I gingerly walked through the small winding path leading to the top, a simple whitewashed structure without any ostentatious designs came into view. With chilly damp winds blowing, I decided to enter the monastery immediately without any further loitering. As soon as I entered the prayer hall on the ground floor, I felt an inexplicable quietude. These are moments which makes travel so special. A huge gold-plated statue of Guru Padmasambhava loomed upon me. An array of candles illuminated the artistic display of murals (wall paintings) and thangkas (cloth painting) depicting Saints and Rinpoches. The place has an unusual calmness. I climbed the creaking wooden stairs to reach the first floor. It was dark and I could see stacks of ancient scriptures neatly arranged in rows in the shelves and on the prayer mats. The only light was from small rectangular windows and the only sound was of the oblique streaks of raindrops getting spattered against the glass. The top floor replete with religious idols, paintings and other antiques has an unusual structure at the centre – an articulately designed seven-tiered wooden sculpture, carved and painted by Dungzin Rinpoche – a former abbot of Pemyangtse. He built this intricate structure over a period of 5 years to portray the celestial abode of Guru Rinpoche known as “Sanghthokpalri”. It has beautiful scenes of angels, rainbows, Buddhist and Bodhisattva idols. Located South West of the Pemyangtse Monastery is the ruins of the erstwhile capital of the kingdom of Sikkim. The worst time to visit this place is monsoons. The 2 km trek from the monastery is through the dense vegetation of chestnut trees. “Beware of leeches and snakes!” said Morong casually. My heart skipped a bit but I walked on following his footsteps. We reached after 30 minutes of walking. The ruins do not justify the effort put in the treacherous trek. The once flourishing palace of Rabdentse was subjected to frequent attacks by the Nepalese and Bhutanese army in the 18th century. These two countries captured a large part of Sikkim and were always a constant threat to the capital of Rabdentse due to its proximity to the borders. In 1814, the capital was moved out to Tumlong rendering Rabdentse as a ghost city. 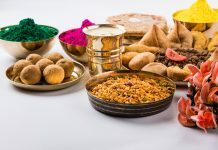 Recent excavations by ASI has unearthed a few interesting things like the prayer place, the king’s bedroom, the courtyard and the royal kitchen. Few stone walls, basement, stairs and three Chortens (Stupas) at the end of the cliff are what remains of the glorious past of the Rabdentse Fort and kingdom. On a clear day, it provides sweeping views of the valley and the magnificent peak of Mt. Kanchenjunga. Pelling is not the quintessential travel destination tourists seek. Isolated location, rustic landscape and inadequate infrastructure work against it. 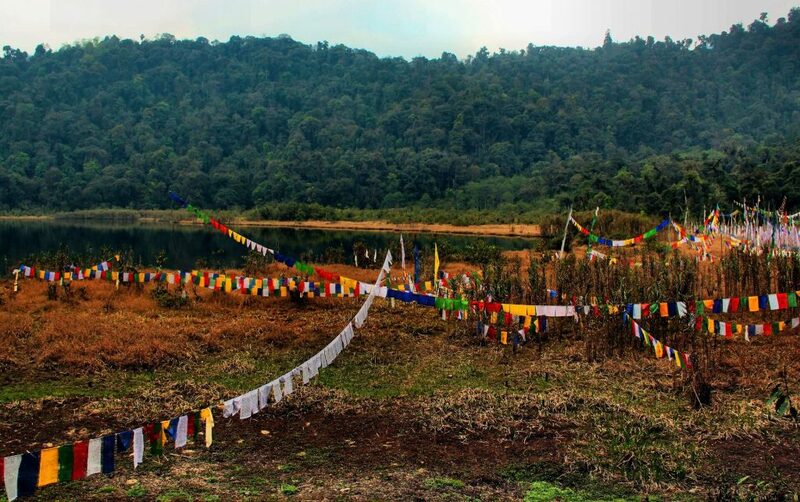 However, the deserted streets of the town, the silence at the magical lake of Khechreopalri and the meditative ambience of Pemyangtse provided me with a sense of warmth and understanding of the mountain village. It’s a place where I can loiter for hours, doing nothing, just being. 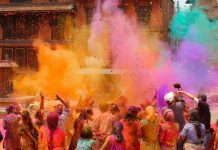 There are daily non-stop flights by Indigo, Air Asia, Jet Airways and Spice Jet from Kolkata to Bagdogra. Pelling is 140 km from the airport. The newly opened Pakyong Airport at Gangtok is also another option. Private cabs will take anywhere between 4 – 5 hours to reach Pelling from either Bagdogra (139 km) or Gangtok (116 km). One way fare starts at INR 4000. October to May. Avoid the monsoon season to have the best chance of viewing Mt. Kanchenjunga. It is also the ideal time to explore the village and other attractions. The following properties offer the best vantage points for Mt.Kanchenjunga. 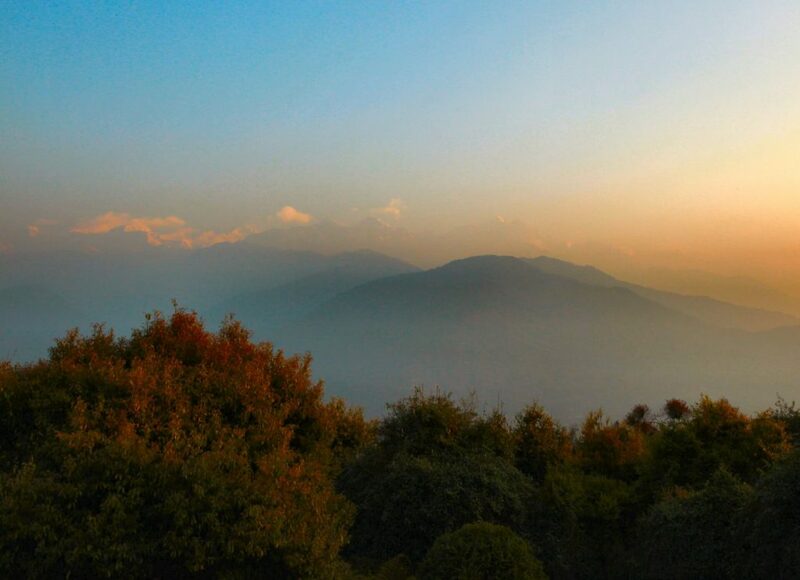 The Elgin Mount Pandim: A luxurious 8 acres property next to the Pemyangtse monastery. Rooms start from INR 12,000 onwards. For the budget seeking traveller, Summit Newa Regency (rooms start from INR 1700) would be the ideal choice. 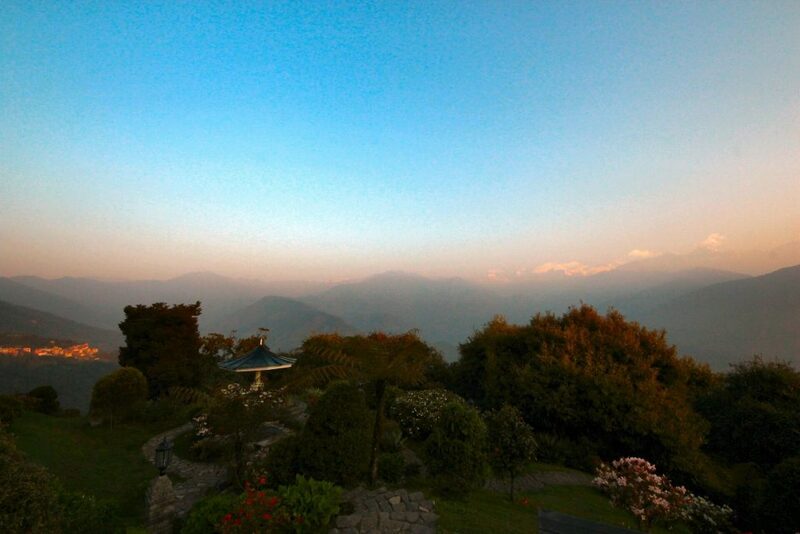 Wake up before sunrise to have the best view of the snow clad mountain peaks. Reserve a day for visiting Khechreopalri Lake and Kanchenjunga Waterfall on the Pelling-Yuksom Road. Diametrically in the opposite direction on the Pelling-Dentam-Uttarey Road is Singshore Bridge – the highest suspension bridge in Sikkim and the second highest in Asia. You can combine this with a morning visit to Pemyangtse Monastery and Rabdentse ruins.